When the bathtub was full of water, these three came along and said, “The bathtub is full – there’s going to be a problem”. ….and there was a problem. The de-leveraging process began, and the bathtub water went draining out. While the liquidity was being drained from the system, the asset values of everything began to fall – quickly and dramatically. Fundamentals meant absolutely nothing. As we all know, there are many of methods to measure the value of equities: discounted value of earnings, discounted cash flows, Enterprise Value / EBITDA, Market Cap / Revenues, Price/ Earnings. They all meant nothing – all at the same time. That was scary. Even the stocks that we felt were very inexpensive – got a LOT more inexpensive. Fortunately, that period is over, as is the party for RWR. Their victory laps are over, their music has stopped. During an appearance on Fast Money in December, the panel was openly hostile to Rosenberg’s continued thesis of problems, problems, problems. To paraphrase, “No, the economy hasn’t turned, and things haven’t become better”. Listening to RWR meant that you missed a 50% upswing in the market. Of course, that’s the problem with structural economists – they see the mountain, but they can’t see through the valley to the other side. 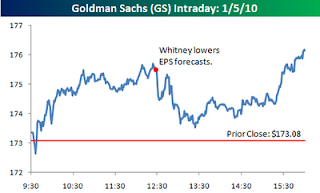 Yesterday, the “W” of RWR slashed her earnings estimates for Goldman Sachs. The market said, “Yawn”. What happens now? Well, over the last 9 months, those asset values that were falling precipitously have once again begun to increase. Fundamentals didn’t mean much again over these last several months as everything increased. This year, we expect fundamentals to mean something. Everything won’t increase indiscriminately. There have been some clear winners in this movement upwards, as companies like Apple (AAPL) have seen very strong increases in their market valuation and market multiples. No doubt here – 2010 will be a stock pickers market, and our list of favorites (both long and short) has been refined. ← Update: When Did Doctors Stop Reading X-Rays?